When it comes to getting the unique creation printed on the apparels, the printing agencies ensure that the feature of the designs turns out in the same way as it was designed. For this purpose, it is vital for the printing agencies to choose such printing method that suits the feel that their customers are looking for. One of the best technique that is skyrocketing these days is direct to garment printing. Direct to Garment printing is comparatively a newer process that has gained immense popularity in a short span of time. Also known as inkjet-to-garment printing, direct to garment printing. It is an ultimate process by which a digital image is directly printed on the clothes. It utilizes a special printer that prints the ink directly on the garment in the desired design. The special inks used in the process are absorbed by the fibers of the garment. 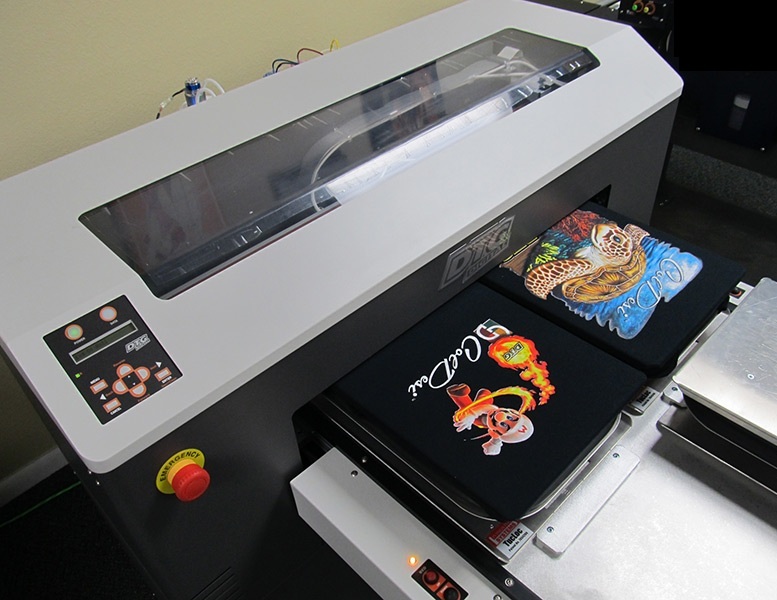 DTG printers operates just like your home or office printer. This technique enables you to print the ink directly on the fabric and create amazing full color images in one pass. This simply means that you no longer need to simplify the designs or eliminate certain colors out of it in order to meet the budget. Since the garment ran through a printer that is connected to a computer, the printers do not require to create specific screens that help replicate the designs accurately. In simpler terms, apart from the initial artwork file, very small setup is needed for using DTG printing. When working with DTG, you do not require screens or any other setup which results in lower setup costs and a reasonable printing technique for you. As the design is printed directly on the apparel, it means that the time taken to produce the garments is minimized to a great extent. When working with direct to garment printing, there is no distinction between creating one garment and 100 garments. There is no limitation of minimum orders. You can easily get any number of apparels printed. DTG is an ultimate printing solution if you are planning to set up your own t-shirt business where you can sell your own creations as it allows you to print without any minimum order quantities. You can easily get the t-shirt printed if you receive any order. This implies that no initial costs is included and all you require to do is to place an order for printing once you receive the order. By doing this, you can easily earn additional revenue for yourself and raise your brand identity. Have you ever clicked an image and thought of getting it printed on your apparel? Now you can get your dream designs printed with DTG printers. It allows you to print any design on a t-shirt exactly in the same way as they look on the camera. This means that you can easily print all the details that you want to include in the picture. Since the ink is printed directly on the apparels and does not need any add on layers, the final output that comes is perfect and does not crack or wear over time. This leaves a long-lasting design that you can wear and wash again and again without becoming damaged or worn. As stated above, DTG process is much simpler than anticipated. So, depending on whatever factors you are looking for, DTG method turns out to be a giant step in garment printing. You can consider this method if you are planning to start t-shirt business in the future. Hope this article helps you in taking a wise decision. We, at No-Refresh provide such product design software that makes your entire designing process hassle-free. Our tool allows the users to design and get them printed directly on the garment without any trouble. For more information, you can check our portfolio section and live demo.